Poetry is definitely one of my favorite units to teach in reading and writing workshop. I love poetry because it is a nice refreshing break from writing literary essays and reading challenging historical fiction books. It is a unit where the students get completely immersed in poetry in both reading and writing. This week, we are launching our poetry unit in my class. I’m hoping to tweak this unit from the past, by using some of the suggestions and ideas from the 5th grade Curricular Plan for the Writing Workshop unit from Lucy Calkins. 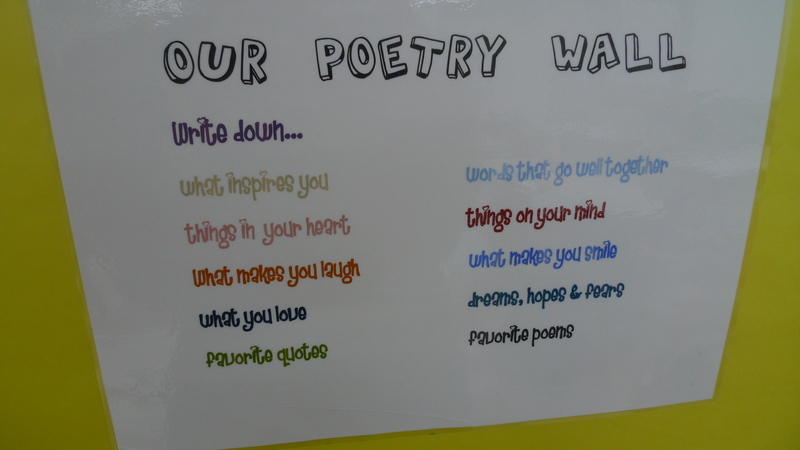 Some of things that I like to do during this unit is have a poetry wall in my classroom. 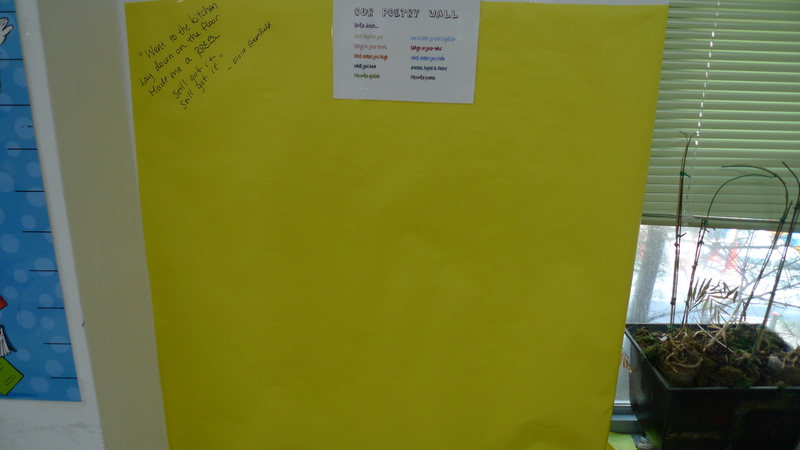 I just get a large sheet of colored paper that I put on the wall. I have the students write down poetry on the wall. They can write sentences, verses, complete poems, and even draw. It’s a wall to inspire them and others. It’s like poetry graffiti that is totally allowed. Some other good ideas that are in the Lucy Calkins’ curricular plan is to start off with a class anthology of poetry. Usually I have them create a self portrait poetry anthology at the end of the unit, but it might be fun to have them doing a whole class anthology in the beginning of the unit as well. I will brainstorm with my students this week on different possible topics we could do a class anthology on. I love teaching poetry too! My kids come up with the most amazing poems. I need to write more… I will too!